In this follow-up to his influential 2010 book, Dark Matter: Art and Politics in the Age of Enterprise Culture, Sholette engages in critical dialogue with artists’ collectives, counter-institutions, and activist groups to offer an insightful firsthand account of the relationship between politics and art in neoliberal society. Sholette lays out clear examples of art’s deep involvement in capitalism: the dizzying prices achieved by artists who pander to the financial elite, the proliferation of museums that contribute to global competition between cities in order to attract capital, and the strange relationship between art and rampant gentrification that restructures the urban landscape. ''Read this book and you will never see contemporary art the same way again. So much of what's wrong with the global economy is wrong with the establishment art world and Sholette has been examining this for a long time in everything he does as an art person. In the many art worlds that exist, we’re happy and proud to be a part of his." "Shifting between artistic practice, curating, writing, and activism, Sholette has been surfing the waves of activist art for more than three decades. His work is based on the multitude of lines drawn from the political art of the 20th century and expanding its realm as it reaches out to the transversal activisms of the 21st century. 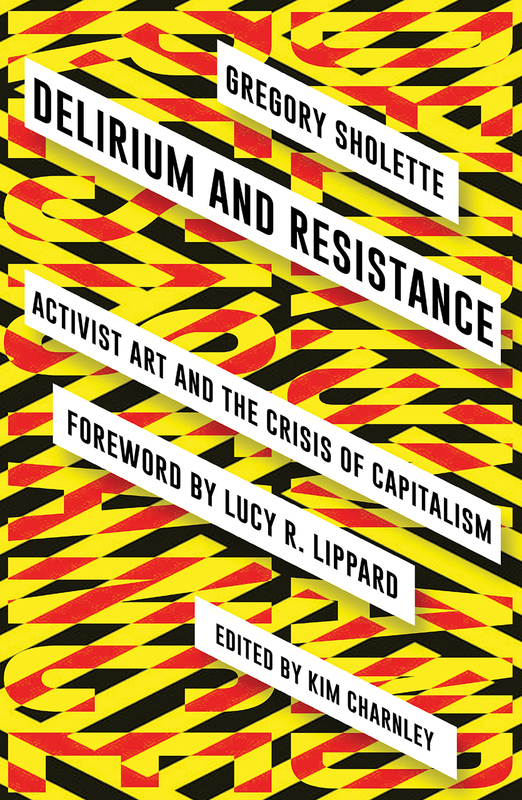 Delirium and Resistance is a manifesto documenting these developments in their broadest forms, from 1980s anti-gentrification efforts and 1990s tactical media practitioners, to the post-occupy-practices of our current circumstances." "Artist/activist Gregory Sholette introduces the term 'bare art' to denote capitalism's treatment of artworks as pure commodities. Stressing the importance of grassroots organizing, he examines how the current marketing system impacts art production and costs." "Delirium and Resistance also summarizes the experience of someone who has been on the barricades enough to relativize both the seemingly endlessness of pessimism and precipitation of euphoria. It is, ultimately, a book written by an artist who has dared to try out many of the ideas on art, power, society and transformation instead of simply enunciating them....His insight provides a rare mix of emergence and history, strategy and conscious planning, enthusiasm and patience, a conjunction highly appreciated in a moment of superabundance of theories and ideals of emancipative action." "Sholette reads the events of Occupy Wall Street as an archival lesson, marking a reactivation of collective political memory and initiating new secrets to liberate the future: 'something being written, call it a promissory note, an obligation to a future reader from a place already dislocated in time.' In this sense, what activists occupied in Zuccotti Park was not just space but time, shared with past and future resistance movements around the world." "Sholette resists any simple solutions in Delirium and Resistance....his writing is incisive and clear, and at times poetic with a savvy use of metaphor. His soft but polemical tone addresses art activism with a nuanced and substantial reading of its condition ('bare art') while affirming the need to harness resistance ('dark matter') into an ever-expanding activist and discursive realm that can navigate art’s relationship to capital, education, gentrification, and social movements." "Sholette embraces the complex, creative and political opportunities accorded by collaborative practice, as radical reaction to the relentless focus on the ‘artist as auteur’ still pushed by countless art schools. By working collectively, artists can offer prefigurative models of real democracy." "No matter where you live today, Scholette’s plea for a more engaged level of artistic intervention feels more urgent than ever."